Editor’s note — Among all types of real estate, only multi-family apartment sales of five or more units remain outside the agency disclosure law, but not so for residential property leases over one year. The objective for the mandatory inclusion of the real estate agency disclosure law in transaction documents is for agents to actually inform the public (and licensees so they are able to answer agency questions) about the duties a licensee owes to members of the public, be they an owner, buyer or tenant. The law was put in place to eliminate omissions about the agency duties of agents, and misconceptions or ignorance about a licensee’s duty by members of the public, also known as principals. the various agency roleslicensees undertake on behalf of the landlords and tenants they represent in leasing transactions. The rules of agency in California are presented in the two-page disclosure form. The exact wording of its content is dictated by statute and thus is nearly identical across all form publishers. Editor’s note — The statutory language is phrased explicitly in the context of real estate sales, not leases, a conceptual deficiency suggesting the statute should have provided a code section and form for both a sale and a lease transaction. The second page of the Agency Law Disclosure defines words and explains phrases commonly used as descriptive jargon within the real estate industry and is an exact reproduction of the controlling code. Though the code is worded in the context of an agent representing a buyer or seller, the same rules of conduct and disclosure apply for an agent of a tenant or landlord, respectively. 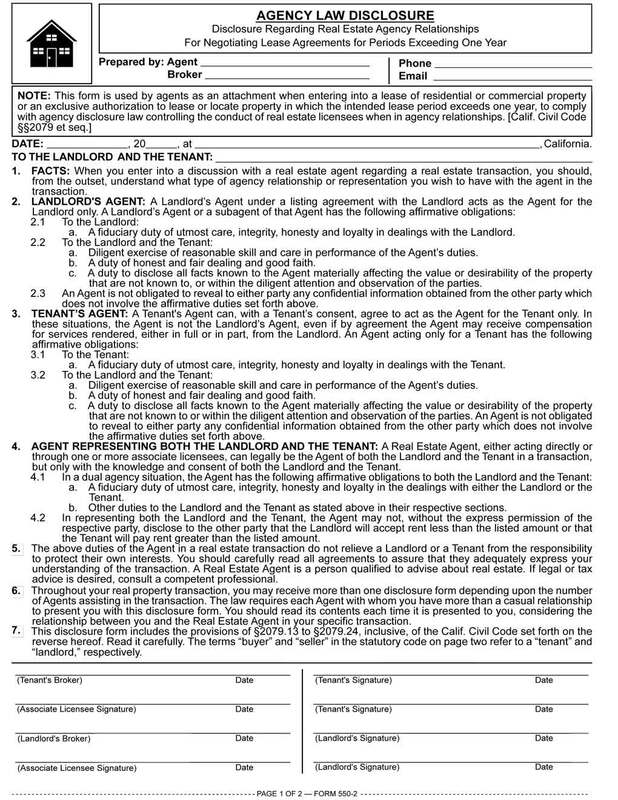 Here, the tenant is cast as the buyer while the landlord is cast as the seller, requiring the reader to translate to apply the rules to leasing situations. The landlord’s agent under an authorization to lease understands the prospective tenant may turn out to be one of their tenant clients. This representation of opposing participants makes the broker a “non-exclusive” dual agent, totally unrelated to any exclusive employment of the broker on a listing by either the tenant or landlord. the general duties owed by each broker to all participants in the transaction, requiring them act honestly and avoid deceitful conduct, known as general duties. Failure of the landlord’s or tenant’s agent to hand their client the Agency Law Disclosure form prior to entering into an exclusive authorization to lease or locate space is a violation of real estate law which carries penalties. As a consequence of this up-front failure, the broker stands to lose their fee when challenged by the landlord or tenant prior to payment of the fee. Further, when the landlord’s broker or their agent fails to hand the landlord an Agency Law Disclosure form when entering into an exclusive authorization to lease, the agency may be cancelled by the landlord at any time. Payment of the fee may be avoided by the landlord even when it has been earned. For the tenant’s broker to protect themselves against loss of their fee due to the failure of the landlord’s broker to provide the Agency Law Disclosure form to the landlord, the tenant’s broker needs to perfect their right to collect their portion of any fee to be paid by the landlord. Further, the landlord’s payment of a fee earned by the tenant’s broker is not enforceable without an Agency Law Disclosure form attached to the initial written negotiations — an LOI or offer to lease — prepared by the tenant’s broker and signed by the tenant prior to submission to the landlord or the landlord’s agent.